Tommy327 replied to [Forum] Which Stylevar is associated with the login/logout font in the top right corner? Someone else must have come across this problem. It's the font color that needs to be changed from white to black or something darker. Maybe this option is not located in the stylevar section? I hope so. I haven't had any trouble finding the other stylevars I was looking for but this one stumped me. Thanks for taking the time to look. 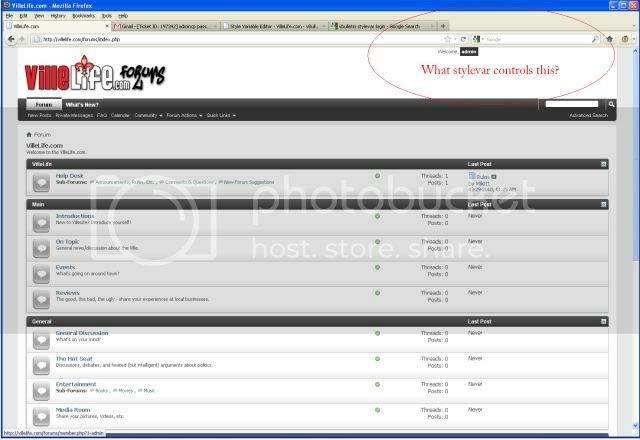 Tommy327 started a topic [Forum] Which Stylevar is associated with the login/logout font in the top right corner? Which Stylevar is associated with the login/logout font in the top right corner? Tommy327 replied to [vB4] How to change category title font size? I just got around to implementing the code today. The answers are out there my friend. Just have to look! Aha! Thank you all very much! I was wondering why I could not find it in the stylevars. Can I change the font size of the thread titles in the same manner? Tommy327 started a topic [vB4] How to change category title font size? [vB4] How to change category title font size? I tried searching for this and couldn't find anything on this issue. If it has already been discussed please link me. I take it this is impossible then. Fair enough. If it's not possible, that's fine. I'd just like to know so I can move on. Sorry to bring up an old post. I figured it would be relevant to put this is here since it pertains to this.